The most incredible rich red Carnations intermingled with silk and satin smooth creamy yellow Roses have given this remarkable bouquet its name; Rossa. It is bound to give a positive reaction! Send it to someone today.The vase in the picture is not included, however if you would like to make your flower gift extra special, add a vase to your order. We recommend the Premium Vase to perfectly complement Rossa. Everything was perfect thank you ! trouble getting the initial order into the system. not enough time before the system time outs you. my friend loved her flowers i sent to her after her brother passed away. Professional, Amazing, wonderful service! I use it every time I nerd and I trust they are gorgeous! Thank you! The flowers were delivered on time and to the right place and they looked great! Very easy to order what you would like. I know they flowers that were delivered were exactly what I ordered and were just beautiful. thank you. i have used this service before and been happy. 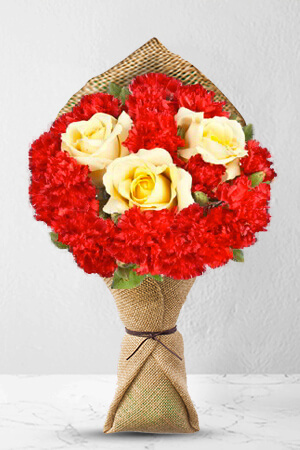 Easy to choose a arrangement and fast delivery. My friend loved the vase the most as long as she was happy so was l.